That request is a perfect example of the skewed perspective many people seem to have on this oil spill situation. The focus should be on the oil ruining the earth, not the politics involved in cleaning it up. Instead of focusing on the fact that these HUMAN BEINGS are giving their time and energy to clean up this disaster, people are actually showing concern that some of them should not legally be allowed to. Whether an illegal immigrant is volunteering his time or working for a paycheck, I have no problem with him providing help to curb this tragedy that will affect the entire planet. Even if you agree that illegal immigrants should not be participating in the clean-up efforts, does it really make sense to investigate the clean-up crews at this time? If anything, it would slow down the clean-up work and would lead to lower numbers of workers once illegal immigrants were removed from the site. This is a perfect example of people focusing on the wrong problems at the right times. If illegal immigrants are participating in BP’s oil spill clean-up, I choose to see it as additional help in ending this mess. 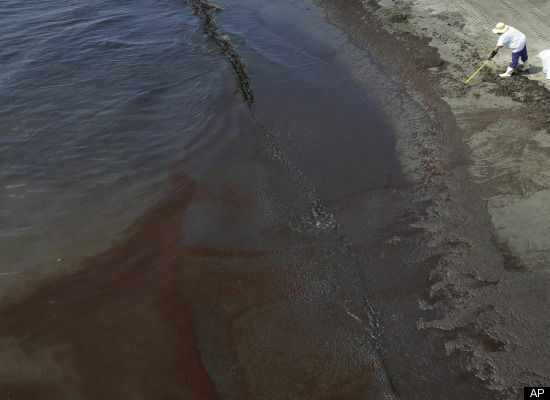 Even though the cap placed above BP’s busted riser pipe captured 14,800 barrels of the leaking oil on Monday, the amount of oil seen leaking from the pipe has not gone down significantly. This means that previous estimates of the total amount of oil leaking each day (surprise, surprise) were seriously low. Once again, a step forward also meant a step backwards. The amount of oil spilling from the riser is enough to match the Exxon-Valdez spill in just 2.5 to 5 days. So far, BP’s oil has been spilling for 50 days. 7 Responses to Illegal Immigrants Helping with BP Oil Spill: WHO CARES? Kudos for writing this information, I do not know about everyone else, but I could totally use it. Keep up the good work, bookmarked and referred some mates. Good post. Hope to read much more excellent posts in the future. In regards to the illegal immigrant claim. WHAT THE HECK is wrong with that Sheriff? Seriously? I’m sure him and Joe Arpaio are great friends. The entire Gulf Coast is being killed off more and more each day and he’s worried that the hired help is illegal!?!?!?!? WHO CARES RIGHT NOW?? I mean I am against illegal immigration for multiple reasons that don’t need to be discussed, but this oil spill is WAY more detrimental and I’m almost glad we have everyone we can possibly find working on this. They call it the GULF OF MEXICO for a reason, why shouldn’t Mexicans illegal or not, NOT want to help? Its their Gulf as much as it is ours.